Mother’s Day is coming up fast. Be sure to get the most important woman in your life something that really stands out. On sale now is a special Mother’s Day Treat Box for $20. It’s filled with cookies, macaroons, cupcakes, and chocolate covered strawberries. 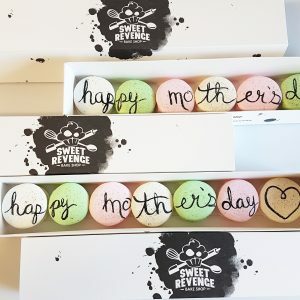 All of our May flavours were made with Mother’s in mind, so fill your Treat Box with flavours like Simply Vanilla, Hoppin’ Carrot, or Ginger Molasses. All of these delicious treats come boxed up with a pretty bow on it to make the perfect gift. We’ve also got 6” and 8” Mother’s Day cakes for $37 (6″) and $55 (8″).